My major projects from 2018: 100 Turtles, Ghost Net Baskets, Moon Bowls, and painting seasonal landscapes. In 2018 I experienced lots of growth in my work and a strong sense of direction. I displayed paintings and sculpture in 25 exhibits – double the amount from 2017! I created 50 new paintings in the studio and outdoors (en plein air), studying seasonal changes in the landscape. 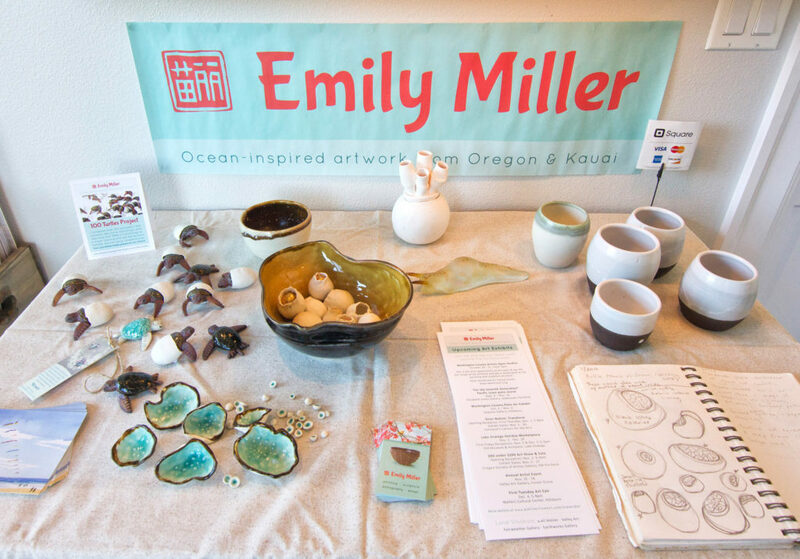 And I focused on combining my artistic goals with my passion for environmental advocacy in two major ocean conservation art projects: sculpting over 100 ceramic sea turtle hatchlings, and stitching 24 baskets from salvaged “ghost net” fishing rope. 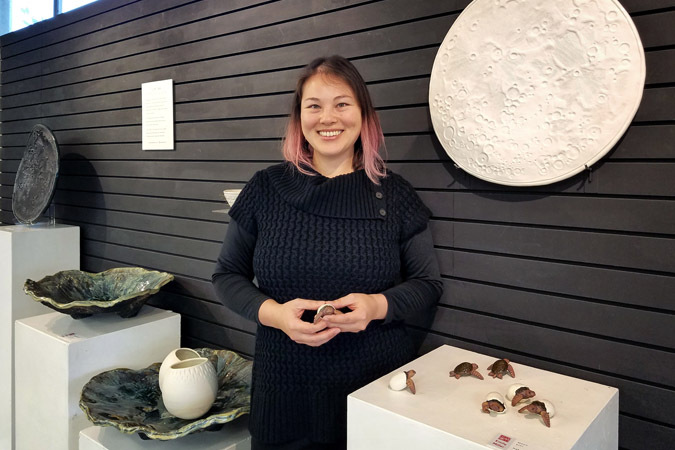 I started 2018 with an exhibit of new ceramics titled “Night Sea,” introducing themes that I continued to develop throughout the year. 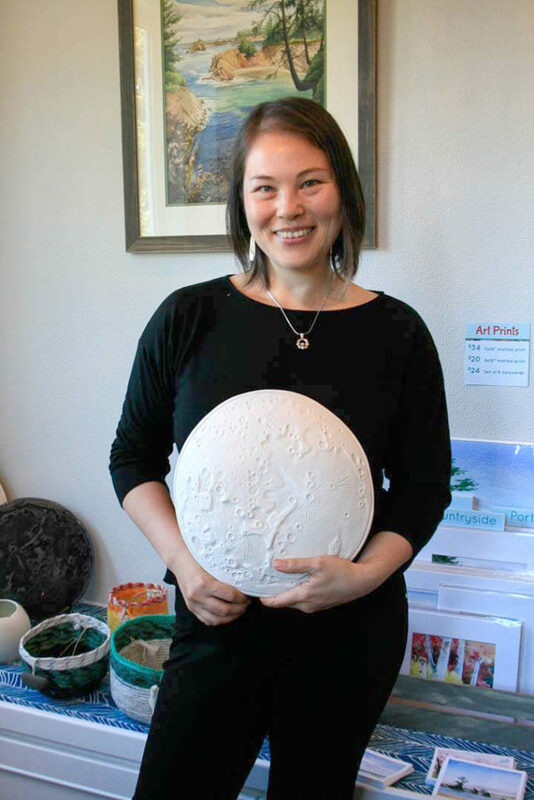 My Moon Bowls and 100 Turtles project grew out of the Night Sea exhibit, exploring the link between vast geological cycles and the rhythms of life on our ocean planet. 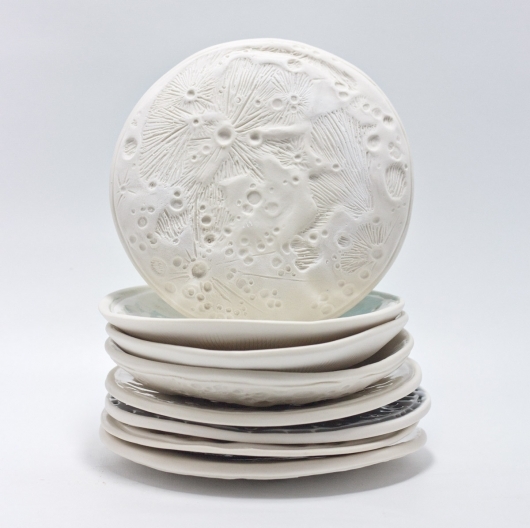 Left: Moon Bowls, available in 3 sizes, handmade paper or porcelain. Since committing to a full-time art career in 2016, I’ve felt compelled to consider how my artwork can support what I believe in. 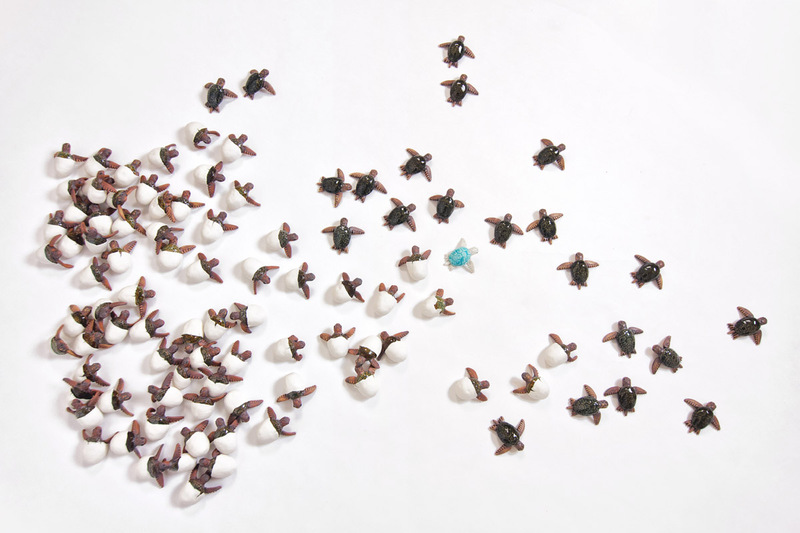 The 100 Turtles project was my first organized attempt to combine art with advocacy, and I consider it my greatest success of the year. 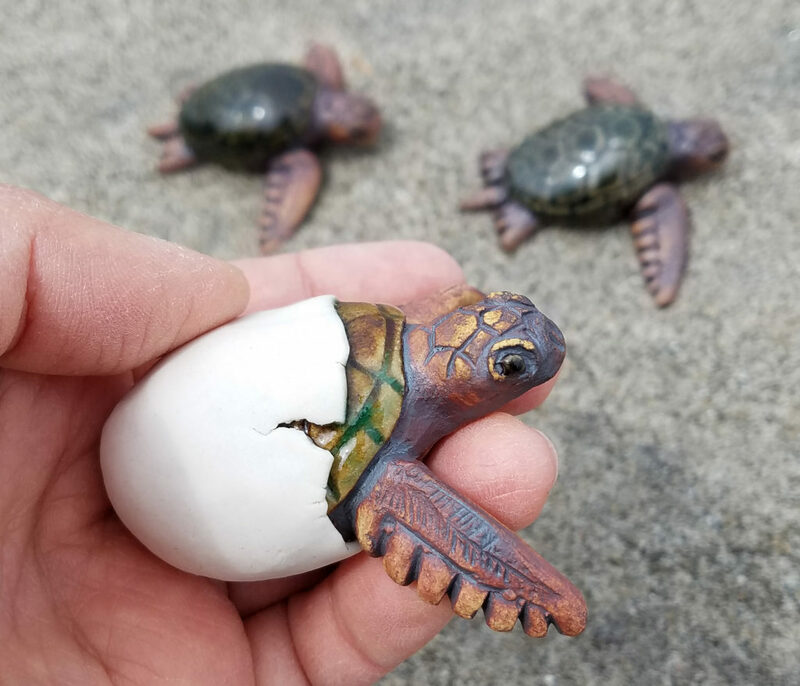 100 tiny hand-sculpted ceramic sea turtle hatchlings made their debut at Fairweather Gallery in Seaside, Oregon, in July 2018. I’ve shared their story with dozens of people this year, and was able to donate $200 to ocean conservation from the proceeds of those sales. 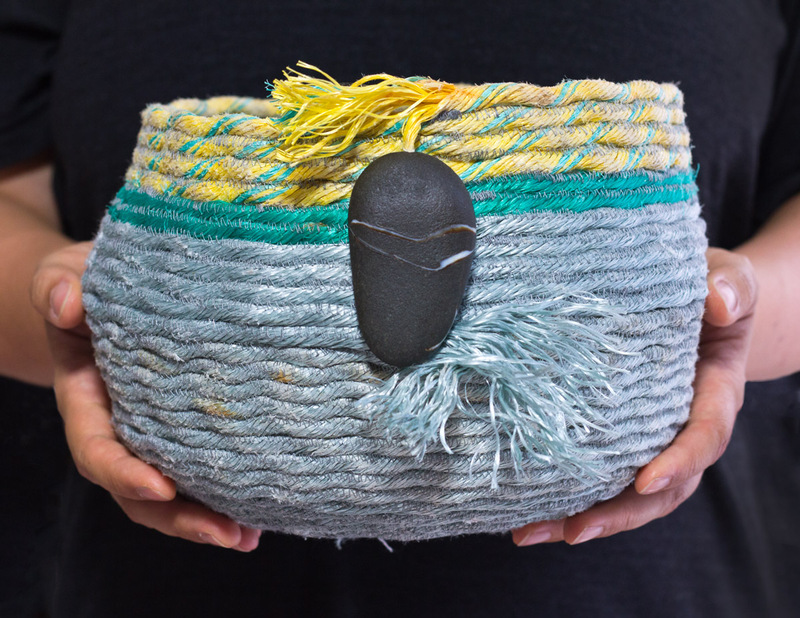 I also continued my work with ghost net fishing rope, creating my third series of Ghost Net Baskets using rope gathered from the shores of Oregon and Kauai. Partnering with Surfrider Kauai and visiting their ghost net storage site was a powerful experience that has inspired me to expand my basket-making into a fully immersive installation project – details to come in the next few months! “Sunbreak” (extra large) – one of 24 ghost net baskets from my 2018 series. I’ve really enjoyed developing partnerships with environmental groups to expand the impact of my work. 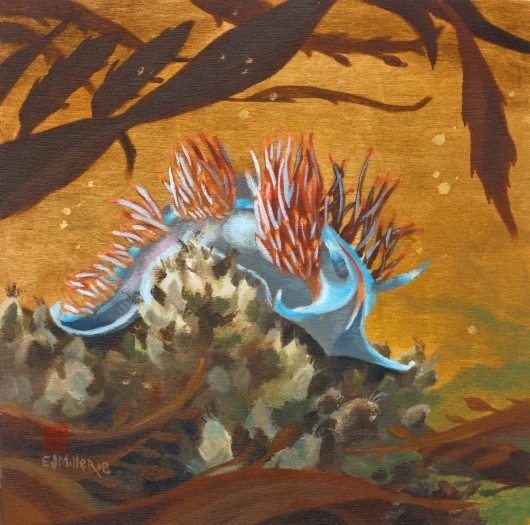 In addition to Surfrider Kauai, in 2018 I exhibited in Elisabeth Jones Art Center’s ambitious Pacific ocean pano-mural project, as well as their “Painting to Save the Trees” ongoing plein air events. One of my goals for 2018 was to paint Oregon’s seasons in plein air watercolors, and I got a great start on it! I created a total of 50 new paintings this year, participated in more plein air festivals and shows than ever before, and presented a plein air exhibit titled “Here and Now” in August 2018. 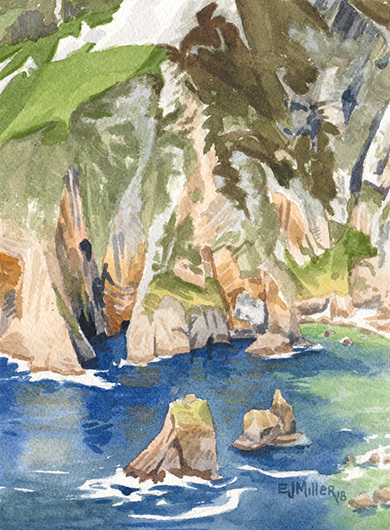 I also spent time exploring the Wild Atlantic Way on the northwest coast of Ireland this summer, painting on location and from reference photos. Click here for the full collection. Left: The Giant’s Chair at Slieve League, Ireland. 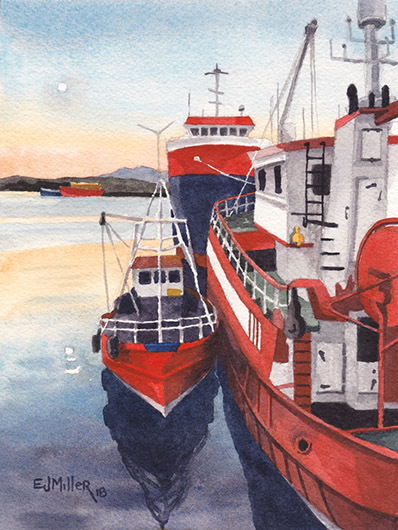 Right: Sunset at Killybegs Harbour, Ireland. 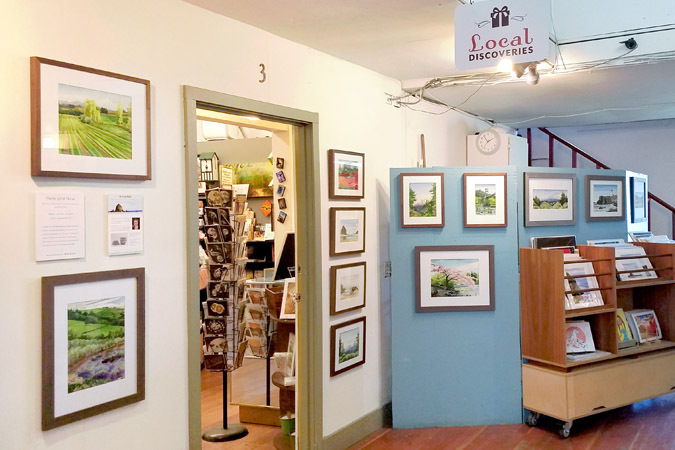 During the year, two of my Oregon plein air watercolors were selected for the permanent public collections of the City of Hillsboro and City of Beaverton. I believe public art is so important, and I am excited for my work to be included in these local collections. A new theme I discovered in 2018 was my role of artist ambassador. Public art is part of this, but more often it involves simply representing myself as an artist, sharing and speaking about my work. In 2019, I’ll be focusing even more on creating my best work for a few select projects. First, I’ll continue painting the seasons in plein air watercolor, but I want to go bigger, better, and push myself to fill in gaps in the seasonal story. I’ll be using my position as a plein air painter to partner with environmental groups and start conversations to consider the landscape from different perspectives. Second, for the past few years I’ve had a studio painting project in mind, originally conceived as the Blue Jade mural. 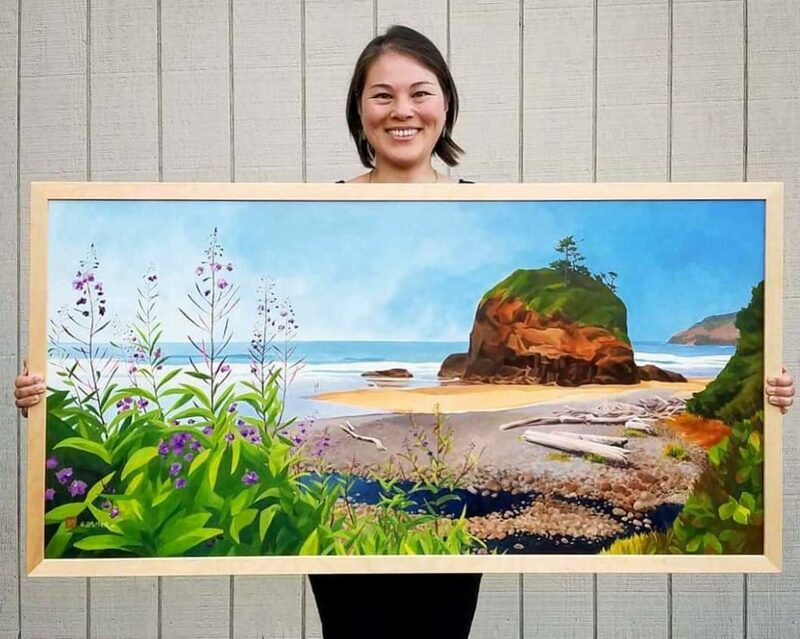 It has now evolved into a broader concept I’m calling “Lush.” Look for the first examples of that work in May 2019 as part of the upcoming “Ode to the Tides” traveling art exhibit, a partnership with The Wetlands Conservancy to raise awareness about Oregon’s estuaries and tidepools. Third, I’m planning to expand my Ghost Net Baskets project into an immersive installation that involves ocean current mapping, more recycled materials, and – hopefully – giant piles of raw, tangled ghost net. 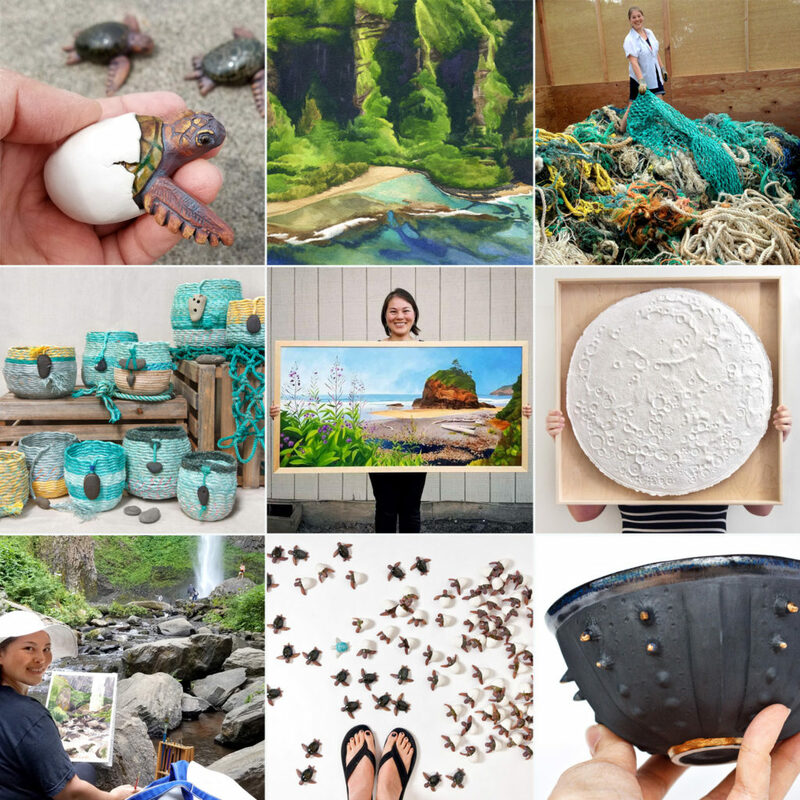 In June 2019, the first part of this work will be shown in “Washed Up,” an exhibit of marine debris art co-sponsored by Surfrider Kauai and Kauai Society of Artists. 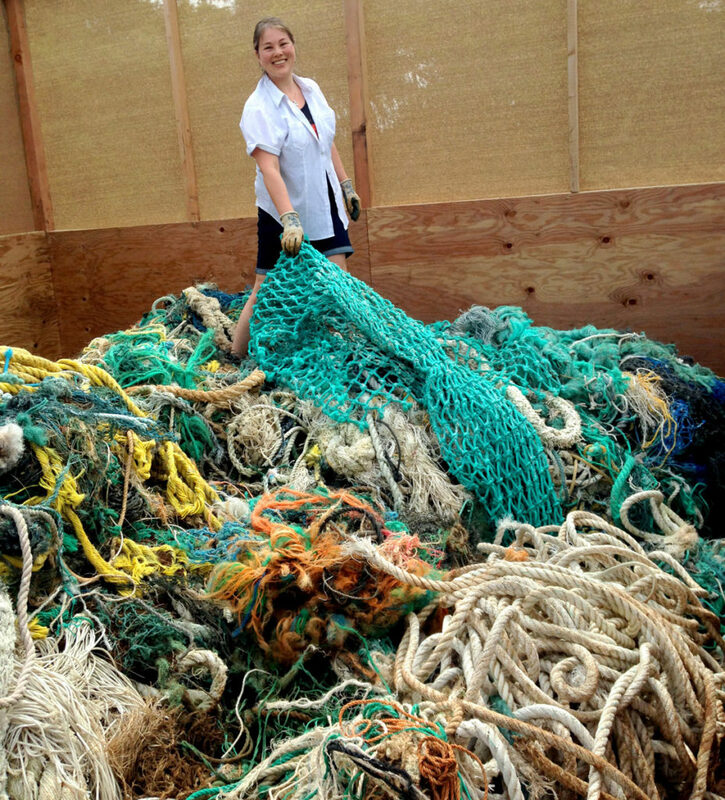 Two tons of fishing rope salvaged by Surfrider Kauai – the inspiration for my Ghost Net installation concept. I am so excited to focus on these projects in the upcoming year, and can’t wait to share it all with you!